Instantly recognizable for the iconic blue light of their meters and the trademark green glow of their logo, McIntosh is a company synonymous with high-end audio. And last week, High-Def Digest was invited to attend a special demo of the brand's latest premium speaker: the XRT2.1K Loudspeaker. 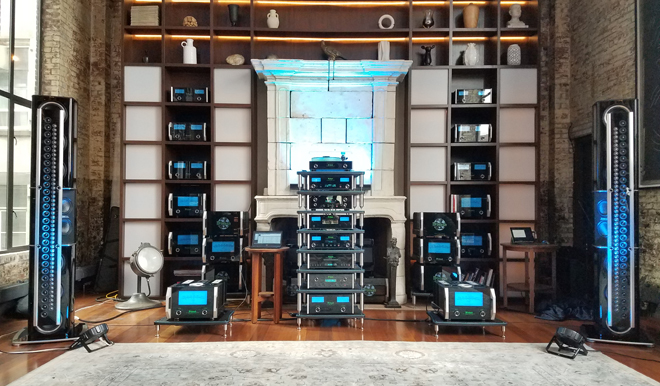 Part of a two-day event held at the historic 5-story World of McIntosh Townhouse in New York City, the demonstration allowed us to hear the monolithic speakers in person with an extended listening session marked by a variety of music tracks covering just about every genre and style. At a commanding 7 feet tall, the towering XRT2.1K speakers use McIntosh's line array design to help create an evenly dispersed stereo image with deep and spacious fidelity, resulting in a truly enveloping sound that is every bit as big as the speaker pair's $130,000 price tag. With its attention-grabbing monolith design, the XRT2.1K features a double architecture construction comprising of an array panel that is suspended in front of a bass column to hold a combined total of 81 drivers. This suspended configuration is inspired by the steel spiders used in skyscrapers to connect glass walls, and the results are strikingly beautiful, creating a faintly sci-fi aesthetic that makes the speaker look like some kind of high-tech terminal you might find aboard an alien spaceship. The array panel itself houses the unit's (28) 2" upper frequency midranges and (45) ¾" tweeters, and features a glossy black design with aluminum trims reminiscent of the classic McIntosh faceplate. Meanwhile, the bass column is separated into three separate enclosures to contain the speaker's (6) 8" woofers and (2) 6.5" low frequency midranges. The bass cabinet is made of a combination of brushed and black aluminum and is finished with 7 layers of high gloss piano black paint. Influenced by the speaker configurations used in PA systems for live concerts, the XRT2.1K takes advantage of its vertical line array design to enable sound projection at a greater distance than a traditional point source design would allow. Likewise, the line array provides reduced sensitivity to early reflections, great power handling, low THD (total harmonic distortion), and an even sound dispersion pattern. With that said, in the past this arrangement has been known to have trouble creating a well-defined soundstage with clear stereo separation, but McIntosh has worked hard to avoid this issue through the specific design and placement of its drivers. To demo the XRT2.1K speakers, McIntosh had a listening area set up in one of the townhouse's larger spaces, providing a much more open environment with higher ceilings compared to the cozier room used for the Sonus faber demonstration. And unlike that shorter session, this extended demo allowed guests to spend quite a bit more time with the speakers as we listened to a variety of high dynamic range digital tracks. All of the digital files were played off of a laptop connected to a McIntosh amp. Setting the stage with some playful fanfare, the first track we heard was the iconic 20th Century Fox theme with blaring trumpets and steady drums, and each element of the score came through with precision and commanding presence. Next, we transitioned to Lou Reed's "Walk on the Wild Side," and it's here where the speaker's detailed sonics really came into focus. Reed's matter-of-fact vocals were clear and clean, and the chorus of "doo doo doo" revealed surprisingly strong stereo separation with a pleasing sense of space between the voices and the instruments. Perhaps most striking, however, was just how full the track's famous bass line sounded. Each strum came through with a deep, textured thud that I could feel subtly resonating beneath my feet, reproducing an impressive level of dimension and nuance in every note. Switching to a classical composition, the demo went on to sample Strauss' "Also sprach Zarathustra," most well known for being used as the opening theme to Kubrick's 2001: A Space Odyssey. The iconic piece highlighted the XRT2.1K's impressive range, as the instruments gradually built to an absolutely room-filling crescendo. After that, we entered blues territory with Mighty Sam McClain's "Too Proud." The speakers gave the vocals a velvety timbre while offering an intimate and realistic sense of dimension between the dancing piano keys, steady drum beat, and gliding guitar strings. Other tracks by The Beatles, The White Stripes, and more all came through with similarly impressive results, though the most memorable track ended up being Pink Floyd's "Another Brick in the Wall." Stereo imaging was fantastic and the song's ethereal use of reverb spread a distinct array of tones throughout the room with a layered yet cohesive sound. As a whole, the extended demo session did a great job of revealing the speaker's many strengths, creating dynamic and richly detailed audio that was capable of getting loud without sacrificing detail. Much like the similarly high-end Sonus faber Aida speakers that I also got to demo (I heard the two a day apart from each other), the XRT2.1K often made it seem as if the band was right there in the room playing live. But while the Aida's created a comparatively intimate soundstage that evoked a small club or recording studio setting, the XRT2.1K seemed to excel more at replicating the feel of a larger concert venue with a bit more kick behind the low end. Of course, the different listening environments could have also contributed to this, but in general I found that the XRT2.1K had a slightly more aggressive approach -- which is something some listeners might either prefer or dislike depending upon personal preferences. In addition to sampling tracks in the typical sweet spot right between the left and right channels, I also walked around the room to hear how the line array configuration handled dispersion. And while the sweet spot was still the best seat in the house, the speakers maintained an impressively consistent sound no matter where I stood, offering little change in perceived volume even when I stood toward the back of the room. Stereo separation did suffer more, but in general, the XRT2.1K was capable of creating a large listening radius, seemingly turning the room into a mini amphitheater. Blending a striking suspended array design with incredibly detailed sound, the McIntosh XRT2.1K Loudspeaker is a genuine marvel of audio technology. With even dispersion that still maintains pleasing stereo separation marked by clean highs, rich mids, and deep lows, the speakers are able to produce a sometimes startlingly realistic presence behind every note they play. 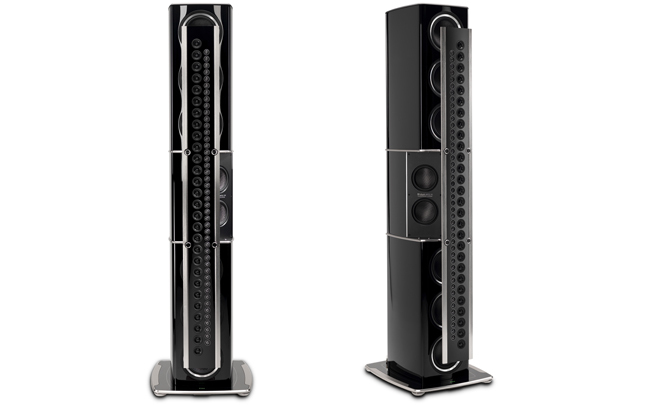 The XRT2.1K speakers are now available for an MSRP of $130,000 per pair. As with the equally expensive Sonus faber Aida speakers, a product this pricey is only going to appeal to a limited selection of wealthy audiophiles, but based on what I heard, those with the necessary funds aren't likely to be disappointed. After all, the cost of an average house is but a small price to pay for being able to turn your living room into a private rock concert on demand.